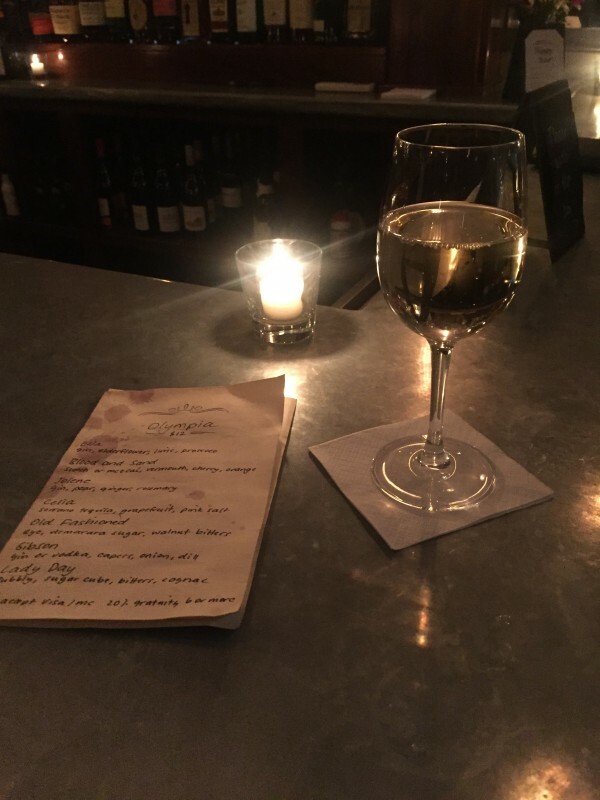 The Place: A cozy wine bar in Dumbo that I desperately stumble into on the first snowy night of the season. The Time: Thursday November 15, 6:15pm. Remember when we were all expecting flurries and we got a snowstorm? Yeah. I was in Dumbo at my co-working space during the day, and was going to a screening nearby at night, so I figured grabbing a drink in between was a good way to spend my time. 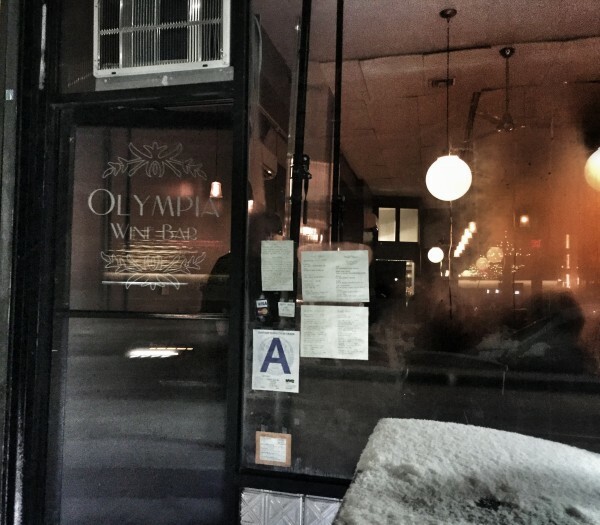 Lucky for me, Dumbo is small so I don’t have to trek too far to get to Olympia, and a wine bar sounds like the perfect haven on this wintry day. The Vibe: Yo it is BUSY on a night when I figured most people would stay home. It’s very tiny so that doesn’t help make it feel less crowded. But it’s exactly what I was looking for - a cute and cozy spot to hunker down. There’s a big group of friends at a table in the front, smaller groups of friends in the back, and the bar is peppered with duos. I snag a seat at the bar near not one, not two, but THREE other solo women! So that’s awesome. It’s dim in here but not too dim that I can’t read, and it’s not too boisterous even though it’s popular. But for some reason, a couple getting their separate checks decide to stand apart from one another at the bar, but still talk to each other OVER the bar. The woman gets very close to me; she reeks of cigarettes and whoops loudly when the internet tells her that she’s right - Paul McCartney does sing the song that’s currently playing in the bar (“Live and Let Die”). The man is upset by this. Gee, maybe the fact that the Beatles comprise the rest of the playlist could’ve been a hint? Blissfully, they leave. The woman at the end of the bar is clearly a regular. I know this by how she closes out with the bartender. (“Liz! I won’t see you until after Thanksgiving!” “Oh noooooo” “Have a great vacation” “Thanks so much, you and Dan are going to Massachusetts right?”) When she leaves, she is immediately replaced by another obvious regular because the second he sits down, he gets handed a glass of white. I’m always impressed by this level of regular-ness. The Bartender: A woman I now know is named Liz. She wears a red and black plaid shirt, and besides greeting and chatting with her regulars, she is otherwise no-nonsense. This is not a criticism - it’s hectic, she’s the only bartender and she’s handling it like a champ. The Drank: It’s a wine bar, so they have wine, duh. Also a small selection of cocktails, some beer and a food menu of mostly meat and cheese, also duh. But they have a dope happy hour so I get the house white, a Trebbiano, for $5. It’s a red wine kinda night but I’m a white wine kinda girl. Though I could really use a hot toddy but we’re just getting into winter so I can hold my horses. Was I Hit On? After I ask for my check, a man taps me on the shoulder. He asks if he can steal my napkin to de-fog his glasses. It’s not a pickup line, he just really wants to see. Should You Drink Here Alone? When you find yourself in Dumbo, sure. Olympia Wine Bar is a comfy neighborhood spot. Certainly if you live nearby, you can work your way toward Regular Status.